Shanghai Beauty - One of The Newest Online Slot Casino Game! Game Information: Be captivated with Shanghai Beauty, a breathtaking online pokie from leading software developer Microgaming. This exciting game celebrates the majestic Chinese culture on five reels and nine paylines and promises plenty of online pokie action and a jackpot of up to 10 000 coins. While the game is not progressive, it does offer some lucrative features like the wild symbol, scatter symbols, and the quintessential free spins. For players who loved Asian Beauty, this game encompasses a beautiful Chinese theme that will appeal to all players. 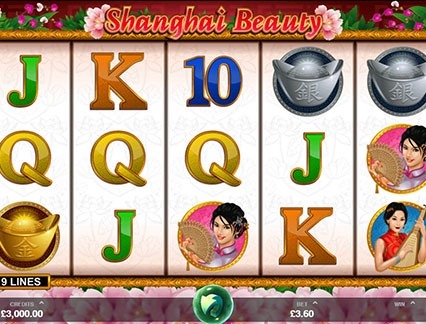 Shanghai Beauty is a five reel, nine payline pokie with a traditional Asian theme, which is complemented by appropriate graphics and sound effects. Symbols that can be spotted on the reels include the Shanghai Beauty herself, an ingot, oriental ship, jade box and traditional letters that act as lower-paying symbols. Shanghai Beauty does not try to break any rules in the Microgaming pokie genre, especially with such a common theme, but it does offer a fun and visually appealing experience that is typical of the software provider. Betting options are flexible, starting at 0.09 up to 45.00 per spin, making it ideal for low and high rollers. 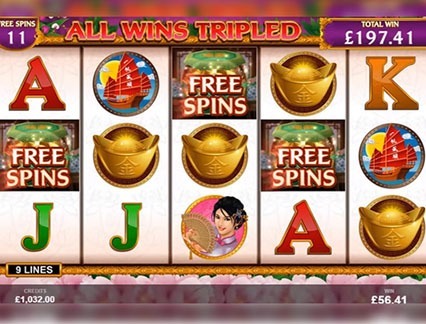 Free Spins – This is triggered when you land three or more jade boxes on the reels and receive free spins. These free spins has a x3 multiplier attached and can be retriggered at any time. Shanghai Beauty Wild – The wild icon replaces all other symbols in the game except the scatter. The graphics and soundtrack features a bold Chinese theme, with a soothing soundtrack and theme-appropriate symbols including a Chinese ship, the Shanghai Beauty, a jade jewellery box, and golden ingot and more. The RTP for Shanghai Beauty is 96.0%, which is above average for an online pokie game. This is a great game for those who like simple pokies with minimal fuss while still maintaining a high quality experience that is synonymous with Microgaming. And those with a propensity for Asian-inspired games are really in for a treat. If you are expecting something new and jackpot wins then this may not be the game for you, but if you are looking for something easy with a decent jackpot of 10 000 coins, go ahead and play Shanghai Beauty today. As mentioned before, there is no much in the way of special features with this game, with all of the action pretty-much based on the triggering of the free spins, after which you will land 15 free spins. Additional free spins can be earned simply by hitting the same symbol combination. All your winnings can be tripled in the free spins bonus round. The free spins round will be activated immediately once you click on the spin button twice and sticky wilds will be present throughout the free spins feature.